Breast abnormalities that can indicate breast cancer are masses, calcifications, architectural distortion and bilateral asymmetry. Here we give a brief description of each of these abnormalities together with the most representative scientific papers published in high impact factor journals. One of the criteria for the selection of papers was their relevance and the number of citations according to SCOPUS database. According to BI-RADS, a mass is defined as a space occupying lesion seen in at least two different projections. If a potential mass is seen in only a single projection it should be called 'Asymmetry' or 'Asymmetric Density' until its three-dimensionality is confirmed. Masses have different density (fat containing masses, low density, isodense, high density), different margins (circumscribed, microlobular, obscured, indistinct, spiculated) and different shape (round, oval, lobular, irregular). Round and oval shaped masses with smooth and circumscribed margins usually indicate benign changes. On the other hand, a malignant mass usually has a spiculated, rough and blurry boundary. 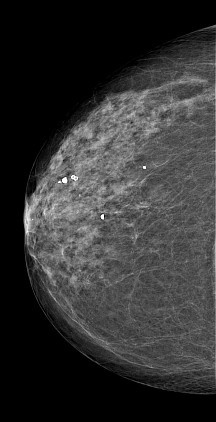 Calcifications are deposits of calcium in breast tissue. Benign calcifications are usually larger and coarser with round and smooth contours. Malignant calcifications tend to be numerous, clustered, small, varying in size and shape, angular, irregularly shaped and branching in orientation. Architectural distortion is defined as distortion of the normal architecture with no definite mass visible, including spiculations radiating from a point and focal retraction or distortion at the edge of the parenchyma. 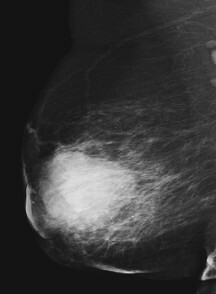 Architectural distortion of breast tissue can indicate malignant changes especially when integrated with visible lesions such as mass, asymmetry or calcifications. Architectural distortion can be classified as benign when including scar and soft-tissue damage due to trauma. 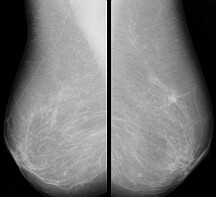 Asymmetry of breast parenchyma between the two sides is useful sign for detecting primary breast cancer. Bilateral asymmetries of concern are those that are changing or enlarging or new, those that are palpable and those that are associated with other findings, such as microcalcifications or architectural distortion. If a palpable thickening or mass corresponds to an asymmetric density, the density is regarded with a greater degree of suspicion for malignancy.